Gene regulatory networks are highly complex dynamical systems comprising biomolecular components which interact with each other and through those interactions determine gene expression levels, that is, determine the rate of gene transcription. In this paper, a particle filter with Markov Chain Monte Carlo move step is employed for the estimation of reaction rate constants in gene regulatory networks modeled by chemical Langevin equations. Simulation studies demonstrate that the proposed technique outperforms previously considered methods while being computationally more efficient. Dynamic behavior of gene regulatory networks averaged over a large number of cells can be modeled by ordinary differential equations. For this scenario, we compute an approximation to the Cramer-Rao lower bound on the mean-square error of estimating reaction rates and demonstrate that, when the number of unknown parameters is small, the proposed particle filter can be nearly optimal. Gene regulatory networks (GRN) are systems comprising biomolecular components (genes, mRNA, proteins) that interact with each other and through those interactions determine gene expression levels, that is, determine the rate of gene transcription to mRNA [1–3]. The signals in GRN are carried by molecules. For instance, proteins which enable initiation of the gene transcription to mRNA (so-called transcription factors) can be considered as input signals. They bind to the so-called promoter regions adjacent to the regulated gene and, in doing so, enable an RNA Polymerase to perform the transcription. On the other hand, proteins that are translated from the mRNA can be considered as output signals. Some of the created proteins may act as transcription factors themselves and upregulate or downregulate gene expressions, that is, activate or suppress the transcription process. This creates feedback loops in the network which allow direct or indirect self-regulation. An illustration of a possible segment of a regulatory pathway is shown in Figure 1. An illustration of a possible segment of a regulatory pathway. Recent development of DNA and protein microarrays sparked a surge of interest in studying gene regulatory mechanisms. The excitement is due to the capability of the microarrays to conduct simultaneous tests of an entire genome of an organism. By testing a number of biological samples taken over a period of time, one can track the network dynamics. The experimental advances have been accompanied by the theoretical developments in modeling and computational studies of the networks. Combination of these research efforts provides critical information about the functionality of cells and organisms, reveals mechanisms of genetic diseases, enables optimization of diagnostic techniques and therapies, and provides aid in the process of drug discovery. To enable the analysis of gene regulatory networks, we need accurate yet tractable models capturing their dynamical behavior. The molecular interactions in gene regulatory networks are inherently stochastic. For instance, the number of created proteins is a random variable due to thermal fluctuations in a cell which cause promotors to randomly switch between an active and a repressed state. The fluctuations in the number of proteins are enhanced by the protein degradation which is a stochastic process itself. This, along with several other sources of randomness, call for probabilistic modeling of gene regulatory networks. However, a very detailed description of a network may be difficult to analyze and often requires considerable computational efforts. Hence, several models with varying degrees of accuracy and complexity have been proposed. These models rely on representations via chemical master and chemical Langevin equations [4–6], and ordinary differential equations [7, 8] as well as Bayesian [9, 10] and Boolean [3, 11] networks. Having selected one of the above models, we are interested in finding its structure and parameters that provide the best explanation of the experimental data. This requires further computational studies and opens up questions related to, for example, stability and control of the network. However, inference problems in gene regulatory networks are often challenging, and the difficulty of a problem increases with the complexity of the model and the size of the network. In this paper, we consider models of GRN based on chemical master equations and study the problem of estimating stochastic rate constants therein. Such models provide the most precise description of the network processes; however, they are also computationally the most demanding. We limit our focus on small-sized networks with a known structure but unknown rate constants. We approximate a chemical master equation by a related chemical Langevin equation  and employ a particle filter with the Markov Chain Monte Carlo move step to solve the rate estimation problem. Simulation studies demonstrate that the proposed technique outperforms previously considered methods while being computationally more efficient. Dynamic behavior of gene regulatory networks averaged over a large number of cells can be modeled by ordinary differential equations. For this scenario, we compute an approximation to the Cramer-Rao lower bound on the mean-square error of estimating reaction rates and demonstrate that, when the number of unknown parameters is small, the proposed particle filter can be nearly optimal. The paper is organized as follows. Section 2 describes the chemical master equation model of a gene regulatory network and its approximation by a chemical Langevin equation. Section 3 presents the particle filtering algorithm for the estimation of the stochastic rate constants and compares its performance with prior work. In Section 4, a deterministic model based on ordinary differential equations is described, and the Cramer-Rao lower bound on the performance of estimating rate constants is computed. Finally, we conclude the paper in Section 5. In (1), denotes the total number of reactions that are possible within the network (i.e., the number of the so-called reaction channels), and is the vector describing change in the number of molecules of each of the species due to the reaction in the reaction channel (e.g., is the change, either positive or negative, in the number of molecules of the network component due to the reaction in the channel). Moreover, in (1) is the so-called propensity function, that is, is the probability that during time interval there is a reaction in the channel. The propensity function can further be expressed as , where is the probability that one reaction takes place in and denotes the number of possible simultaneous reactions. (The coefficients are often referred to as the stochastic rate constants. The function counts all possible combinations of individual molecules that may lead to a reaction in the channel.) The chemical master equation is often used to simulate the Markov process and enable computational studies of GRN. To this end, one may employ various stochastic simulation algorithms, originally proposed by Gillespie . We should point out that while the chemical Langevin equation (2) may be used as a network model for the purpose of parameter estimation, in general it is not sufficiently accurate to provide reliable simulations of the network dynamics. To conduct computational studies of a GRN, we still need to model them using stochastic simulation algorithms. In , the authors find the best linear-model fit to the data presumed to be generated by (6), and then infer parameters based on the derived linear model. In [15, 16], the use of statistical mechanics tools for the estimation of the parameters of a network modeled by (6) was considered. In [17, 18], a Markov Chain Monte Carlo (MCMC) algorithm was employed to infer the network parameters. This approach provides sound estimate of the parameters, but it requires a very high computational effort. As an alternative, we propose the use of a particle filter with an MCMC move step. This we describe in the next section. where , , , , , and denotes the covariance matrix of the measurement noise. Introduction of the missing values enables propagating (9) by means of a particle filter, where the filter relies on a Gaussian importance density (12). A simple sequential importance resampling (SIR) scheme provides asymptotically consistent estimates, that is, the approximation converges to the true value of the parameters as the number of particles grows. However, the SIR scheme often suffers from sample impoverishment and, therefore, has weak performance. To improve the sample diversity and the performance of the particle filter, we employ the importance sampling scheme with an MCMC move step. Specifically, we use the Metropolis-Hastings algorithm to decide whether a resampled particle will be accepted or not. For implementation details, we refer the reader to the formal algorithm given below. Set . Draw from the prior density . Assign particle weights , for , and normalize them. Draw a candidate from a kernel density , where is the empirical covariance of in the previous step and is the smoothing parameter. Draw missing data from an importance density and set . where denotes viral protein molecules and denotes synthesized viral cells. Reaction is the processes of producing viral cells from the viral and protein. 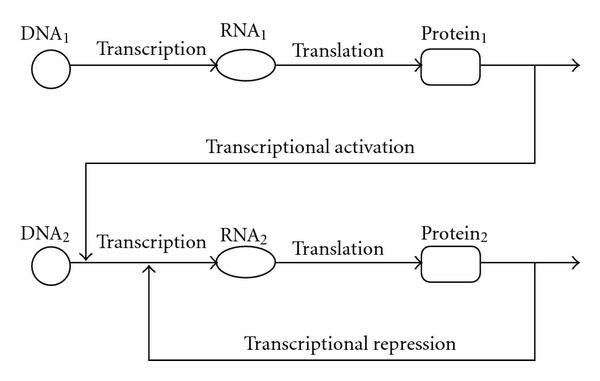 Reactions and are the transcription and translation process of the viral genes, respectively. Reaction models replication of a viral template into a viral . For the purpose of parameter estimation, we assume that the above network evolves according to (3). However, the network is simulated via the Gillespie's algorithm, with the rate constants set to . We refer to the proposed particle filtering algorithm with MCMC move step as Algorithm 1, and employ it to estimate parameters in this network. The performance of Algorithm 1 is compared to the MCMC method proposed in , denoted for convenience as Algorithm 2. Algorithm 1 is performed with , , and the resampling threshold . Both algorithms use noisy observations of the network states and employ the same initial sample distribution. The log values of the parameters are initialized from the uniform distribution , and the noise variance is assumed to be known. (Note that even though does not belong to the initialization range, the proposed technique accurately infers its value.) Figure 2 compares the mean square-error of estimating the parameters of the viral infection network using Algorithms 1 and 2, obtained by performing simulation runs. Clearly, the proposed Algorithm 1 outperforms Algorithm 2, while being roughly times faster—the average running time of Algorithm 1 is 1030 seconds, while the average running time of Algorithm 2 is seconds (simulations in Matlab). The mean-square-error performance comparison between Algorithm 1 (particle filter) and Algorithm 2 (MCMC) as a function of the variance of the observation noise σ2 ( ). Reactions represent the reversible processes of repressor protein binding to and . Reactions are the transcription and translation processes of genes and . Reactions represent the degradation process of proteins and mRNAs in the system. The state vector collects the numbers of components , , , , , and , and hence it is a -dimensional state vector. Similar to the study of the viral infection network in the previous subsection, to infer the reaction rates, we assume that the above network evolves according to (3). However, the network is simulated via Gillespie's algorithm. In particular, we generate noisy observations , , where the measurement noise is Gaussian with (i.e., the noise variance matrix is ). The particle filter (Algorithm 1) is performed with , , and the resampling threshold . The log values of the parameters are initialized from the uniform distribution . The reaction rates are inferred as the mean values of the distributions estimated by the particle filter. True values of the parameters and their estimates are shown in Table 1. When Algorithm 1 is performed with and MCMC iterations with a burn-in period, the runtime of Algorithms 1 and 2 is comparable but the former is significantly more precise than the latter. In order to achieve similar performance, Algorithm 2 requires significantly higher complexity ( MCMC iterations with a burn-in period). True and estimated parameters for the two algorithms. Algorithm 2(i) employs MCMC iterations, and Algorithm 2(ii) employs iterations. Other steps of Algorithm 1 remain unchanged. where denotes the matrix with all zero entries except the entry which is equal to . Notice that are functions of and ; therefore, we can recursively calculate from and . The value of s can be obtained by numerically solving (19) (e.g., using Mathematica). This enables computation of and, therefore, the desired CRLB. (Note that the CRLB computed in this section assumes the discretized model (22); as , it approaches the true bound on estimating in (19)). Figure 3 shows the mean and standard error of inferring the reaction rates using the proposed estimator, shown as a function of the variance of the observation noise (discretization time: , the number of particles: , the noise variance: ). Several of the parameters are estimated very accurately (e.g., , ), while others have relatively large mean-square-error (e.g., , ). Figure 4 compares the estimation mean-square error with the corresponding CRLB, plotted as a function of the number of measurements used for the estimation. As indicated in Figure 4, the estimator performs close to the CRLB for several of the parameters (e.g., , ), while for other parameters there is room for improvement. The mean and standard error of the particle filter estimator for the inference of reaction rates in a viral infection network, shown as a function of the variance of the observation noise (the number of particles used is ; performance is averaged over simulation runs). The CRLB and the average mean-square error of the particle filtering algorithm (the number of particles , noise covariance matrix Σ = I). In this paper, we studied the problem of estimating reaction rates in a gene regulatory network modeled by a chemical Langevin equation, that is, a high-dimensional stochastic differential equation. We proposed a solution which employs a particle filtering algorithm with Markov Chain Monte Carlo move step. Extensive simulation studies demonstrated that the proposed technique requires less computational complexity to achieve performance comparable to previously proposed methods. Moreover, we considered the deterministic description of the average network dynamics based on an ordinary differential equation model. For this scenario, we computed an approximate Cramer-Rao lower bound on the mean-square error of the estimation and demonstrated that, for some of the parameters, the proposed particle filter can be nearly optimal. The computed CRLB is indicative of the number of data points (i.e., the number of experiments) required to achieve a desired accuracy of inferring reaction rates. Further studies are needed to enable near-CRLB performance in the scenario of estimating a large number of unknown parameters. This work was supported in part by the National Science Foundation under Grant no. CCF-0845730.